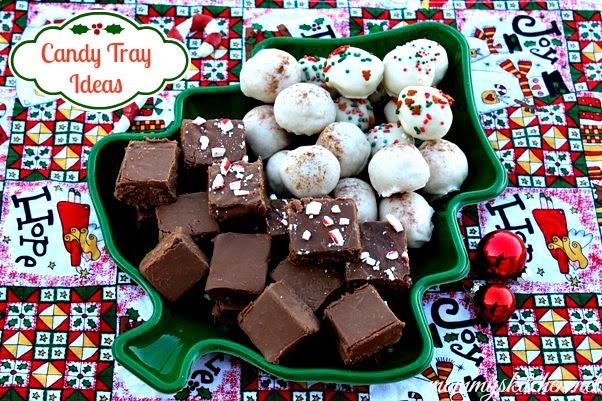 The holidays just aren't the holidays without the addition of a DIY Christmas Candy Tray. I love making homemade candies and have been making them for years. It all started when oldest son was in grade school and back when money was a little tighter. The kids and I love giving holiday gifts for their teachers throughout the year, but it can get expensive. Instead of buying gifts I started baking some of my favorite tasty treats for everyone to enjoy. About a month before the holidays I start baking cookies and making candy to give to everyone that has touched us in special way. My kids teachers, my husbands boss, co workers, family, friends, neighbors, our mailman, and even our family doctor. DIY Candy and Cookies are easy to make and such an affordable gift idea. Today I want to share a few homemade candy ideas that won't break the bank and are certain to deliver holiday cheer to everyone. The first treat is Oreo Cookie Truffles. I have made several of these for just about every holiday. A couple weeks back I found some Limited Edition Egg Nog Candy Melts by Wilton at my local Walmart. I knew immediately that I wanted to use them to make cookie truffles. I used Golden Vanilla Oreos for the cookie center and the eggnog flavored candy coating. I finished them off with a light dusting of cinnamon, but you can also use nutmeg. While I was in the cake decorating isle I came across a new brand of candy melts that Walmart is carrying from ChocoMaker. They come in a variety of festive flavors like Sugar Cookie, Red Velvet, Peppermint, Hot Chocolate and Gingerbread. Of course I grabbed a bag and made some Sugar Cookie Truffles as well. Break up vanilla Oreo cookies and place in food processor. Blend on highest speed until cookies are finely chopped. Using a hand or stand mixer combine the cookie crumbs with cream cheese until well blended. Chill mixture in refrigerator for 30 minutes. Roll the mixture into 1" balls and place on wax paper covered cookie sheet. I used my small one inch cookie scoop and scooped out enough of the mixture and then rolled into balls. Place back into the refrigerator and chill for another 15 minutes to help retain shape when dipping in melted chocolate. 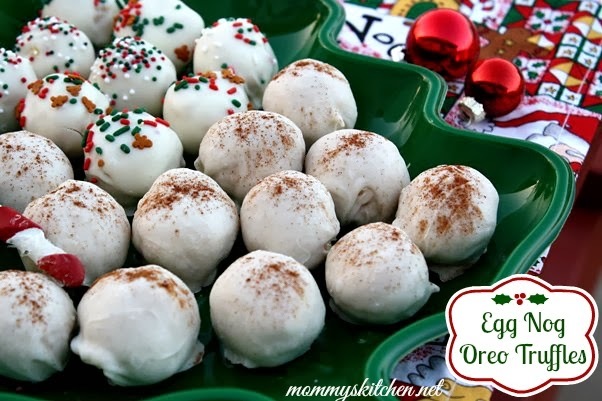 Melt the Wilton eggnog candy coating in a microwave safe bowl on the defrost setting of your microwave. Melt in 3 minute intervals until completely melted. You can also use a double boiler. 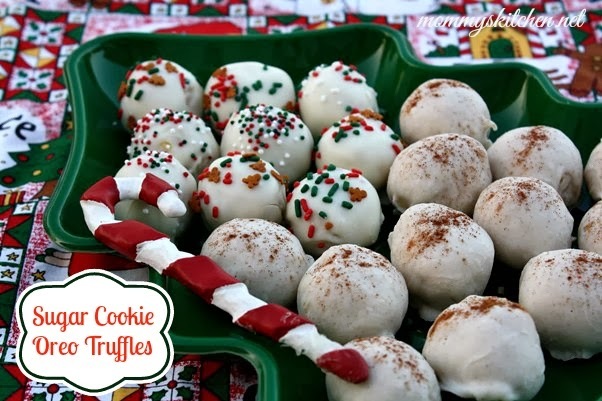 Using a fork dip the cookie balls into chocolate, tap off extra and set truffles aside on wax paper covered cookie sheet to harden. Dust lightly with cinnamon or nutmeg. 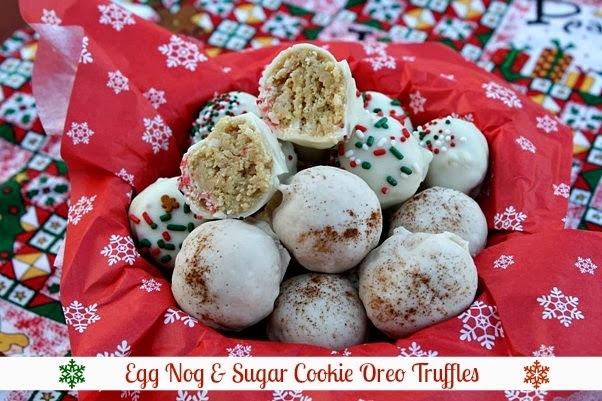 Cook's Note: To make Sugar Cookie Oreo Truffles prepare recipe as directed above using the golden vanilla Oreo cookies. Dip the cookie balls into Sugar Cookie Candy Wafers by Chocomaker and add a bit of festive sprinkles on top to resemble a sugar cookie. Both of the candy melts can be found in the holiday baking section, as well as the cake decorating isle with the rest of the Wilton Candy Melts. ChocoMakers price is $2.87 per bag which is comparable to Wilton's Candy Melts priced at $2.50. To finish off the candy tray I wanted to add something chocolaty, so I made a batch of this easy Milk Chocolate Fudge. 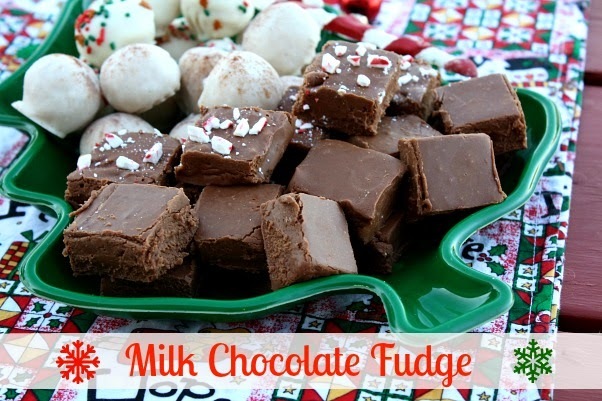 You can't have Christmas without homemade fudge and this recipe is the best foolproof one I have found. Believe me I've messed up my share of fudge recipes, but this one seems to turn out perfectly every time. You can also change out the milk chocolate chips and substitute with peanut butter or butterscotch chips. I found the cute little Christmas Tree Cookie Tray in the holiday baking isle for .97 to place all my homemade candy on. Just wrap the tray with plastic wrap, add a bow and a gift tag and your done. Homemade Candy Trays make the perfect gift!!!! Line 8-inch square baking pan with foil or waxed paper. Lightly butter the foil or paper and set aside. Combine sugar, evaporated milk, butter and salt in medium saucepan; bring to rolling boil over medium heat, stirring constantly. Boil mixture for 4 minutes exactly. Remove from heat. Stir in marshmallows, milk chocolate chips, vanilla and nuts (if desired) until marshmallows and chocolate melt and blend. Pour into prepared pan. Chill until set 4 hours or over night. Cut into 1-inch (2.5 cm) squares. Store in refrigerator in sealed container. Cook's Note: Crushed candy canes can also be added to the top of the fudge before refrigeration. Everything on your trays looks so yummy. I'm going have to check and see if our Walmart has them flavored candy melts. Do you have a tip for making these without a food processor?